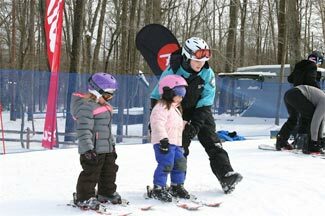 Are you interested in working at Powder Ridge Mountain Park & Resort or Brownstone Park? We have summer & winter jobs. If you are interested in working at Powder Ridge or Brownstone, we are collecting applications for employment opportunities. The application is available in Adobe PDF and Microsoft Word format. You may send your application via US Mail, or complete the application and upload to us via email using the form below. OR – Save your file electronically and submit below. Ensure you provide a valid email address as this is how we will first contact you concerning future employment. Download the PDF file listed above, complete the application. Scan and upload the file here. Snowmaking is cold, wet work often done overnight during the coldest hours of the early morning. The snowmaking position involves routinely walking down steep and snow covered trails to check on, maintain and adjust snowmaking equipment as needed. Snowmakers will need to be available when it’s cold and may be asked to work lengthy shifts when weather conditions are favorable for snowmaking. Must be committed to providing a quality product for guests to enjoy, as well as committed to performing job duties in a safe and efficient manner. Must be able to ride a chair lift and not be afraid of heights. Must be able to carry loads in excess of 50lbs and walk all over the mountain in extreme conditions. Snow Groomers are responsible for efficiently producing a safe and consistent product in varying weather conditions. Must be flexible with schedule and may be asked to work lengthy shifts on short notice. Experienced with heavy equipment preferred. Lift operators are responsible for the safe and efficient operation of our chair lifts as well as providing friendly and helpful service to our guests. Maintain loading and unloading ramps ensuring sufficient snow at proper depths and ensure they are properly groomed. Must be able to work standing up for extended periods of time and withstand extreme weather conditions. Our lift/tubing attendants are responsible for the safe and efficient operation of our chair lifts as well as providing friendly and helpful service to our guests. Our ticketing/cashiers/advance reservations must be team players ready to greet and provide an exceptional customer experience to our guests on a consistent basis. Our rental ambassadors must be ready to meet and greet our guests as they enter our rental facilities. You will be the first point of contact for our guests and must provide them with exceptional customer service at all times. Our Rental Shop Technicians must be team players ready to greet and provide an exceptional customer experience to our guests on a consistent ongoing basis. Our parking lot attendants greet our guests upon their arrival at the resort and aid in creating a positive, memorable experience through guest interaction, including but not limited to answering questions and providing directions such as facility information. A person qualified to be a Ticketing Lead at Powder Ridge Mountain Park and Resort will be outgoing, friendly, courteous and respectful. They will be required to be knowledgeable about all of the products and services that we offer, including price, durations, availability, benefits and features of each offering. Said applicant must be able to speak fluidly, clearly and confidently on the telephone and must have strong computer skills. They will be a leader and be able to supervise several employees per shift in a very efficient manner. This applicant must be trustworthy, responsible and capable of settling and balancing cash drawers. Any other reasonable task, as asked by your supervisor or director. A person qualified to be a reservationist at Powder Ridge Mountain Park and Resort will be outgoing, friendly, courteous and respectful. They will be required to be knowledgeable about all of the products and services that we offer, including price, durations, availability, benefits and features of each offering. Said applicant must be able to speak fluidly, clearly and confidently on the telephone and must have strong computer skills.